Made from a robust polypropylene fabric with a plastic coated or micro-porous film. Custom made, Custom Fit. 100 percent waterproof material protects your vehicle against wet, humid and dusty climatic conditions. High performance fabric naturally resists moisture, fungus and expels stale odor. Double Interlock Stitched Heavy Car Body Cover with Mirror Pocket. Ultimate Durable UV/Sun protection to protect your interior and paint. Tailor-made to the exact specifications of your vehicle's year, make, model, and configuration options. Washable and Does not fade. Free Storage Bag. No Antenna Pocket. In House Manufacturing. MAKE IN INDIA. Autofurnish presents superior quality waterproof car cover that made from a polypropylene fabric with a plastic coated or micro-porous film. When rain hits this type of cover, it beads up and rolls right off. The water may pool on the hood of the vehicle, or another flat surface of the vehicle, but not to worry. Your vehicle will stay dry and free from any chemical compounds. You can always lift the cover and give it a shake to encourage the water to drain off the side of your vehicle. Water and rain will not penetrate or pass through this type of cover fabric. 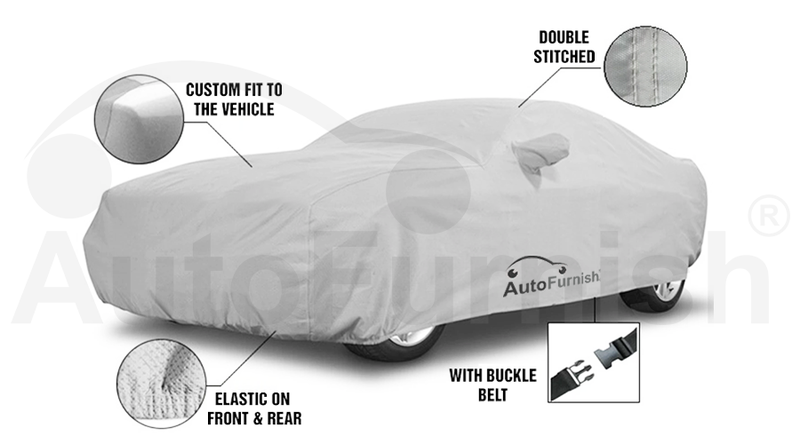 Autofurnish Acho car cover will keep your vehicle completely dry underneath. This is a great choice if you lack indoor storage space such as a garage or covered parking. Not only will this block out all rain and water, what you don’t see is that it is also blocking out other unseen tiny particles that can damage your paint finish over time, such as acid rain and an array of chemical compounds. There are reflective safety warning strip on the both trim sides of car cover, to protect your vehicle from crash at night. A tailor fit storage bag with box packing is included. Storage bag keeps your cover clean, tidy and tucked away when not in use. Warranty: 1 Month Manufacturing Defects Warranty. In The Box: 1 Pcs of Autofurnish Car Body Cover. Very good product, Worth buying. Except that everything is fine. Product quality is excellent. It is as good as mentioned in site. Good quality product, easy to install and proves its purpose. 7 Depth Layer protection to your car interiors. Luxury styling with a Quality fitted finish. Detachable curly mats make cleaning easy and also be removed whenever required for luxury styling. Setup easily & securely in secs. Water resistant coating on the outer layer and soft, non-abrasive layer on the inside Very good for water repellency Durable and accommodates a good number of tissues (depending on tissue thickness) Easy to store and pull tissues. Recommended for your car – For a classic interior experience, this tissue box is a must-have! Long bristles with wooden handle.